The narrator first begins to write during one of her many train journeys between Gothenburg and Stockholm. The journey encompasses an entire universe. In the first heat of the summer the narrator travels between present and past, between childhood and middle age, between her mother and her daughter. Her narrative comes to life, is a fragmented and unconventional story about a symbiotic relationship with a mother. A complicated relationship, but then aren’t they always? In writing about her mother, the woman becomes involved in the family history. So station by station, sentence by sentence, thought by thought the narrator comes to understand who she is. 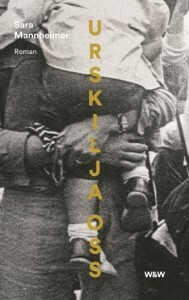 Urskilja oss is a story about powerful love, about the power of dependency, about the power of words. Written by a prize-winning and idiosyncratic voice. Sara Mannheimer grew up in Gothenburg and studied in the USA, the Netherlands and the Czech Republic, before settling down in Stockholm. Besides writing, she runs the glassworks “Stockholm Heta Glas”. Her novel Reglerna (The Rules, 2008) was nominated for the August Prize and won the prestigious Borås Tidnings Debut Prize.